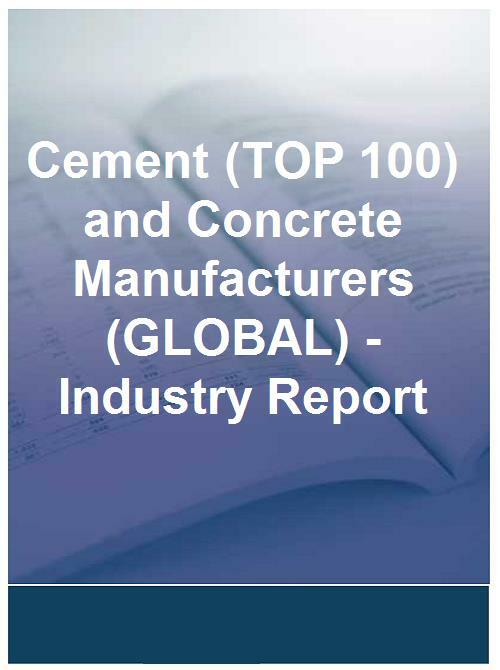 The Cement (TOP 100) and Concrete Manufacturers (GLOBAL) Analysis provides a detailed overview of the Cement (TOP 100) and Concrete Manufacturers (GLOBAL) market and delivers a comprehensive individual analysis on the top 100 companies, including HEIDELBERGCEMENT AG, FOMENTO DE CONSTRUCCIONES Y CONTRATAS SA and TARMAC HOLDINGS LIMITED. Using exclusive methodology, a quick glance of this Cement (TOP 100) and Concrete Manufacturers (GLOBAL) report will tell you that 55 companies have a declining financial rating, while 5 have shown good sales growth. Subsequently, you will receive a thorough 100-page market analysis highlighting the latest changes in the Cement (TOP 100) and Concrete Manufacturers (GLOBAL) market. The Cement (TOP 100) and Concrete Manufacturers (GLOBAL) analysis is the most definitive and accurate study of the Cement (TOP 100) and Concrete Manufacturers (GLOBAL) sector in 2017. The report is split into three sections and uses both a written and graphical analysis - analysing the 100 largest Cement (TOP 100) and Concrete Manufacturers (GLOBAL) companies. The Cement (TOP 100) and Concrete Manufacturers (GLOBAL) report contains the most-up-to-date financial data and Plimsoll applies these figures to create their unique and authoritative analysis. Best Trading Partners: These are companies that are winning in both sales and financial strength - for example SUMITOMO OSAKA CEMENT CO LTD has been ranked as a best trading partner in the industry. Sales Growth Analysis:This section reviews the fastest growing and fastest shrinking company - for example GRUPO ARGOS S.A. is among the fastest growing. Profit Analysis - Analysis of gross profit and pre-tax profit over the last ten years and a profitability summary comparing profits in the industry against small, medium and large companies. Market Size: Based on the largest 100 companies, this is a comparison between last year's market size and the most current figure (This year the market has increased by 3.8%). The next section focuses on company analysis and provides an in-depth analysis of the largest companies within the Cement (TOP 100) and Concrete Manufacturers (GLOBAL) industry. The Cement (TOP 100) and Concrete Manufacturers (GLOBAL) analysis also provides you with full business name and address, name and ages of directors and registration address.